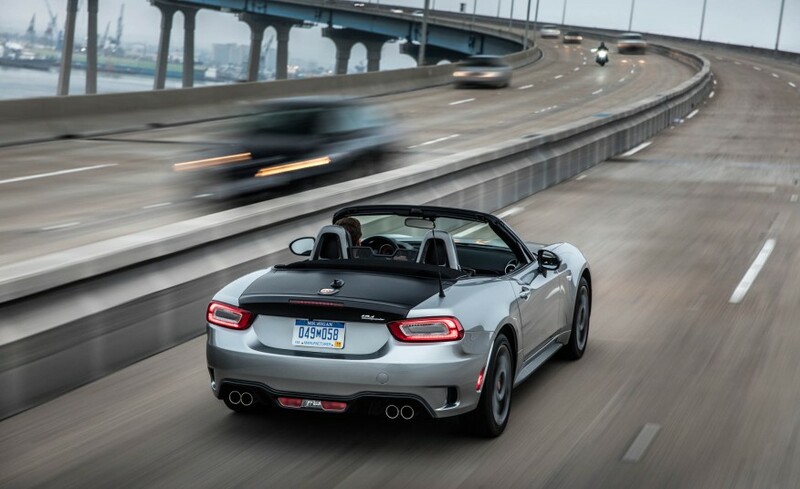 Built in Hiroshima, Japan, by Mazda, Fiat's new Spider wears its own distinct sheetmetal and is five inches longer and about 100 pounds heavier than the Miata. Fiat didn't change the MX-5 platform's 90.9-inch wheelbase, which means the extra length is all in the front and rear overhangs. Next to the Mazda, the 124's nose looks longer and more upright. In back, the extra length yields a larger trunk opening and an extra 0.4 cubic foot of capacity. 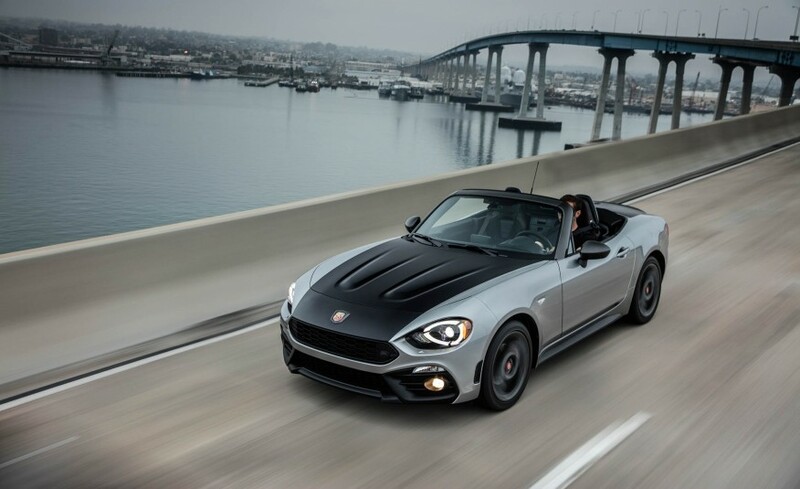 Italian design house Pininfarina penned the original 124 Spider, and Fiat has wisely chosen to crib some of the styling elements from it for the new car. The shape of the headlight cutouts, the hood bulges, and the kink in the doors are all lifted straight from Pininfarina's design. We would've preferred something sexier than black plastic to fill the front grille opening, but we like what Fiat has done here, giving us a retro foil to the Miata's modern design idiom. The 1.4-liter turbocharged four-cylinder engine under the hood also marks a departure from the Mazda version and its naturally aspirated 2.0-liter twin-cam four. Assembled in Italy, the 1.4T is shipped complete to Japan to be installed during final assembly. The engine is similar to the one in the Fiat 500 Abarth, with 4 psi of additional turbo boost and modifications for longitudinal mounting in the rear-wheel-drive Spider. Bolstered by 22 psi of boost, this MultiAir four makes 160 horsepower at 5500 rpm and 184 lb-ft of torque at 2500 rpm; opt for the Abarth version of the 124 Spider, and you'll get four more horses but the same amount of torque. There's a nice surge of turbo boost and torque at about 2000 rpm, but the thrust tapers off beyond the 5500-rpm power peak. Unlike the Miata, which is good to the last rev, the Fiat's final 1000 rpm before its 6500-rpm redline isn't worth exploring. Compared with the 155-hp 2.0-liter in the Miata, the turbocharged engine comes across as lazier and less eager to be abused. Some of that is certainly due to the easy flow of low-end torque, but the Fiat never feels any stronger than the naturally aspirated Miata. Turbo lag is present, but it's easy to mitigate by keeping the revs above 2000 rpm. However, should you roll through a stop in second gear and lug the engine down to idle, you'll find there's a delay before the engine wakes up. Fiat claims a zero-to-60-mph time of 6.8 seconds. We think that's slightly conservative?after all, we've achieved a 5.9-second zero-to-60 time in the Miata?but we won't know for sure until we've tested the 124. A six-speed manual transmission is standard, and this one works as brilliantly in the Italian job as the six-speed unit found in the Mazda. Shifts are short and precise, and the engine is alert enough to make rev-matching a joy. Our only gripe, and it's an exceedingly minor quibble, is that the Spider's squared-off shift knob is less pleasant to grab than the Miata's spherical one. We also found that the turbo engine is quite happy working with the six-speed automatic transmission, a $1350 option. Shifts are quick, downshifts are immediate, and the automatic is smart enough to keep the four-cylinder's torque at the ready. In the base Classica and the more luxuriously appointed Lusso models, the engine is eerily quiet. 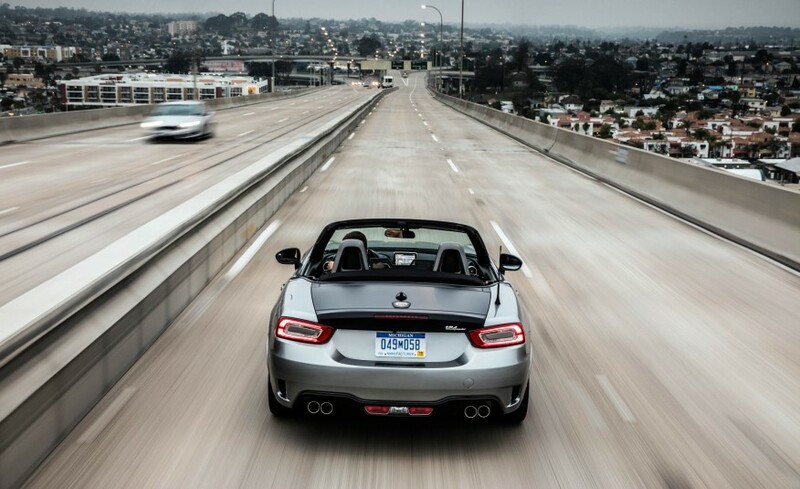 Unlike the version in the 500 Abarth, the Spider's engine is far more muffled. Under hard acceleration, there's not much sound coming from either the intake or the exhaust. 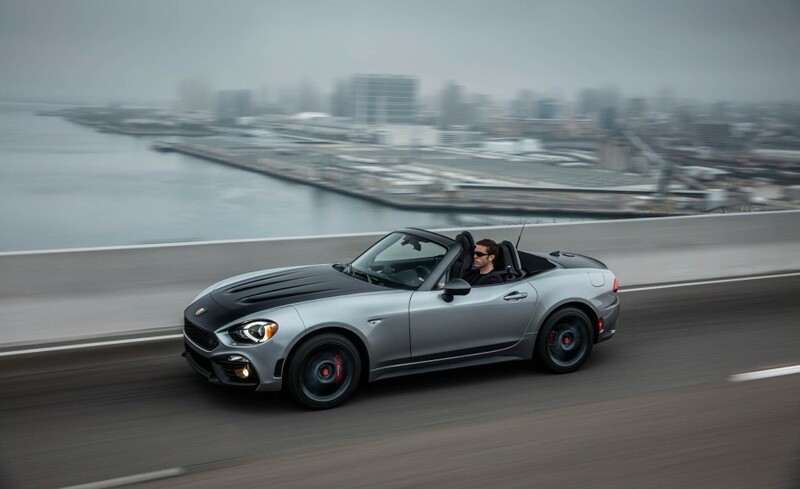 The sportier Abarth Spider with its standard quad-pipe exhaust turns up the volume, but it's never as blatty and attention-grabbing as the 500 Abarth's exhaust note. For those who want it louder, there's a Record Monza Dual Mode Performance exhaust available as a dealer accessory. A calmer, quieter, and more mature Miata appears to have been Fiat's brief. An acoustic windshield, a slightly thicker top, and more sound deadening under the carpet and along the firewall all serve to reduce noise levels when the top is raised. 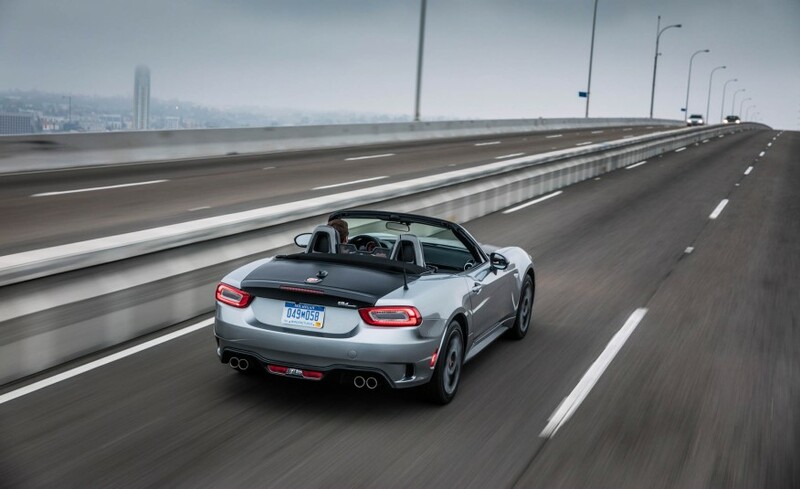 Along with the extra length, the sound deadening and acoustic windshield are the big contributors to the 124 Spider's aforementioned 100-pound weight gain over the Miata. This is still a loud car to ride in if you judge by family-sedan standards, but it's quieter than the sometimes raucous Miata. We're unlikely to wish for earplugs after a two-hour highway drive in the Fiata. This maturity extends to the Fiat's chassis tuning. The control-arm front and multilink rear suspension setups carry over, but Fiat brought in its own dampers, springs, and anti-roll bars. The tires, whether the 16-inchers on the Classica or the 17s on the Lusso and the Abarth, are the same as the Miata's. Ride quality on the rather smooth roads around San Diego was similar. 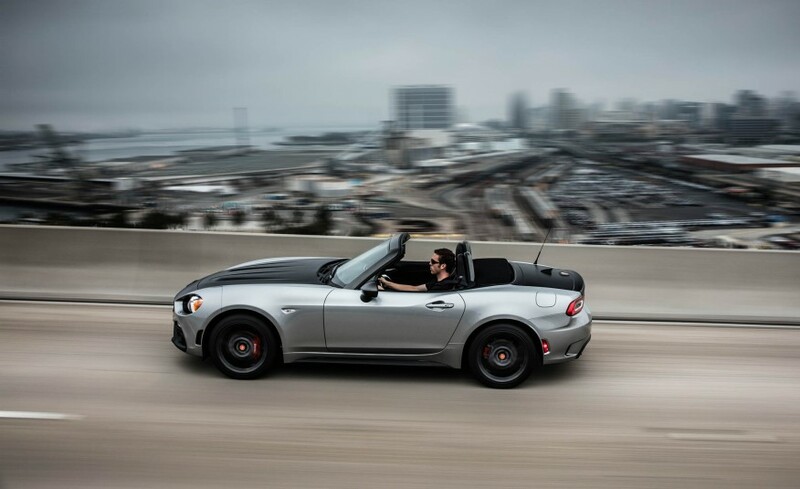 The biggest dynamic difference between the two is the Fiat's reduced body roll: Fiat's tuning takes the Miata off its toes and puts it on its feet. Turn-in is less abrupt and more gradual. Aimed straight down the road, the Fiat requires fewer steering corrections to stay in its lane. Some will miss the Mazda version's nervous energy, but we appreciate that the Fiata skipped that last shot of espresso. Interior changes are more superficial than those outside, with the layout and underpinnings the same as in Mazda's roadster. Fiat changed the gauge faces, added a few soft-touch materials, redid the door panels, and screwed on that squared-off shift knob. Fiat specified its own seat fabric and padding, and leather is available in Lusso and Abarth models. We particularly like the Abarth's standard leather and faux-suede seats. Passenger-side legroom remains tight, especially for anyone more than six feet tall. The most satisfying thing is that Fiat didn't mess up our beloved Miata. Fiat's changes imbue it with enough civility to make it more palatable to those, say, over the age of 40. It's quieter, a bit more composed, and slightly more relaxed. Fiat's 1.4-liter isn't lusty enough for roadster duty, and aside from the Abarth version it doesn't sound like much, but it does provide that easy torque. Pricing starts at $25,990 for the Classica, while the automatic Lusso opens at $28,490 and the Abarth comes in at $29,190. These prices are similar to those for the Miata's Sport, Club, and Grand Touring trim levels. Driving down to San Diego, we had our doubts about what Fiat might do to one of our 10Best Cars award winners, but our fears were assuaged. Indeed, as we drove back up I-5 in our long-term Miata, we understood why someone might actually prefer the Fiat 124 Spider.